Product prices and availability are accurate as of 2019-04-22 13:41:43 EDT and are subject to change. Any price and availability information displayed on http://www.amazon.com/ at the time of purchase will apply to the purchase of this product. 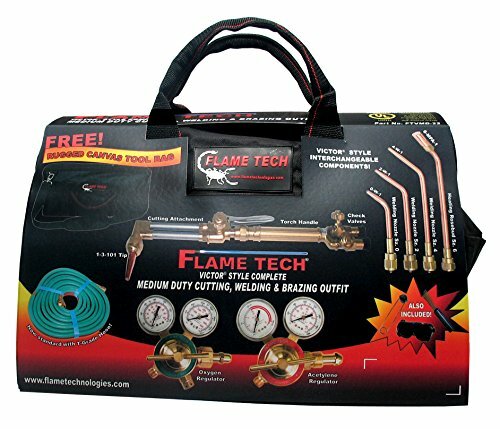 Medium Duty Cutting, Welding & Heating outfit-Regulators, Torch Handle Cutting Tip, Heating Head, Hose, Goggles, Spark Lighter, Check Valves and Bag included. Compatible with Victor Products. Cuts up to 6", Welds up to 3/8 steel with optional larger tip.